Bill Brett has been taking pictures for more than half a century, a significant portion of them for The Boston Globe, which he joined as a part-time photographer at age 18. After taking a company-offered buyout from the paper in 2001, Bill continues to contribute to the newspaper’s pages while producing five books ­– Boston: All One Family; Boston: An Extended Family; Boston: A Year in the Life; Boston: Inspirational Women; and, Boston: Irish. Bill is working on his sixth book, Boston: Game Changers, which is slated to be published in late 2017. The first three books proved to be bestsellers for Commonwealth Editions. The subsequent two have been successful titles for Three Bean Press, which is Bill’s publisher for Boston: Game Changers. Bill’s books are available for purchase. See descriptions and links below. 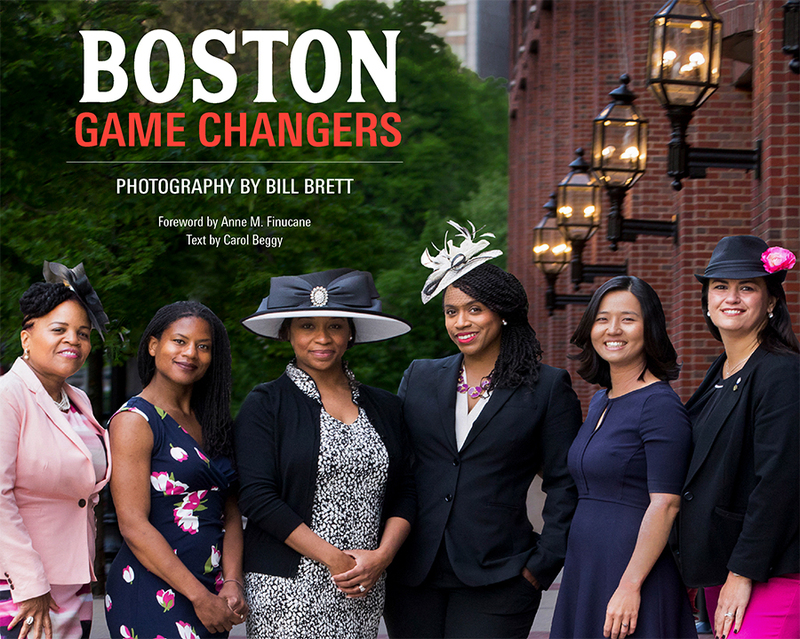 Bill Brett returns in 2019 with his sixth book, Boston: Game Changers, about the people in Boston who are doing great things, making a difference, and leading the city into the future. Featuring a mix of black-and-white and color photographs, Bill’s portraits include quiet volunteers and those doing cutting-edge medical research. He is finishing up this latest volume and we will post more details about this volume soon. Please write to Bill@BillBrettBoston for ordering information! A collection of more than 260 black-and-white photographs this book turns the lens on Bill's own community, the city's Irish Americans. Dedicated to his mother, Mary Ann Brett, this book chronicles and crystallizes a unique period in the city's history. A time that won't be seen again, inhabited by newly arrived immigrants and second- and third-generation Irish-Americans. Boston, Irish covers every aspect of the region s Irish-American community with portraits and stories ranging from a 99-year-old nun to a colorful funeral home director to an Irish tenor to a New York Times best-selling novelist. It also explores the full breadth of the Irish immigrant experience, representing those from the Republic and Northern Ireland and both Roman Catholics and Protestants alike. To all those who knew her, Mary Ann Brett was the embodiment of grit, heart, and faith. For her and those of her immigrant generation, Boston's sense of Irish community didn't stop with one family or a single neighborhood. It was felt grandly, holding in its embrace the Irish Americans from Beacon Hill and City Hall to the very last street in the city. When the world thinks of Boston, they think of the Irish as the city's bulwark community. What Bill Brett thinks of Boston runs much deeper and can be found on each and every page. Father-and-daughter photographers Bill Brett and Kerry Brett offer their first collaborative book Boston: Inspirational Women. Compelling for its content and stunning in its beauty, Boston: Inspirational Women is comprised of more than 125 black-and-white portraits, revealing prominent doctors; accomplished actors and writers; the first female iron-worker to top off a Boston high-rise; respected business leaders; a woman who ran the Boston Marathon blindfolded; successful politicians; dedicated moms; and some of the most important philanthropists in the country. The book is about women who are making a difference in Boston, and the world. Bill set out on a year-long quest, from April 16, 2007 to April 21, 2008, to photograph an image a day somewhere in the City of Boston. The result, Boston: A Year in the Life, takes readers from neighborhood to neighborhood and from face to face, taking one picture every day of the year. The result is an intimate and affecting portrait of the city, from iconic events like the Boston Marathon, the Red Sox winning the pennant, to backstage, backyard views of the city at work and play. This book brings readers everyday Boston, as we live and experience it. The sequel to Bill’s 2005 best-seller, Boston, All One Family, offers another 250 portraits of Greater Boston's leaders in business, the arts, sports, and the nonprofit arena—from Boston’s renowned photographer. With virtually unlimited access to the city's leaders, Bill Brett spent two years stitching together a beautiful portrait of Boston—not the bricks and buildings, but the people who make it move. There are celebrities aplenty here (from pols and pundits to actors and artists) but there are also dozens of images of community leaders who donate their time and money to make Boston a family more than ever.